Heat a very large skillet over medium high heat until hot. Add the oil to the skillet, then the onion and the garlic. Sauté until onion is just beginning to soften, about 4 to 5 minutes. Add the red pepper and sauté until it begins to soften, about 2 to 4 minutes. Remove mixture from skillet with slotted spoon and reserve. Add a bit of additional oil if needed, then add the Italian sausage to the same skillet. Brown the sausage over medium heat, breaking up the larger chunks. Add the vegetable mixture back to the skillet. Stir in the Kumato® brand Tomatoes, tomato paste, herbs, cayenne, a 1/2 teaspoon each of the salt and pepper, and the jalapeño peppers. Simmer over medium heat, stirring occasionally, until mixture begins to thicken, about 25 to 35 minutes. Taste and adjust seasonings. Butter a 9” x 13” pan. Lay half the bread over the bottom of the pan, cutting slices to fit if necessary. Top the bread with the tomato sauce. Sprinkle sauce with half of each of the cheeses, the remaining bread, and finish with the remaining cheeses. Combine the eggs, milk, mustard, and a teaspoon each of salt and pepper, in a medium size bowl, and whisk until very frothy. Pour egg mixture over ingredients in the pan. Tap pan overnight or for a minimum of 8 hours. When ready to bake the strata, preheat oven to 350°. Slice the two reserved tomatoes and lay over the top of the strata. Place uncovered in the hot oven and bake about 60 to 70 minutes, or until the strata is set in the middle, puffy, and a deep golden brown on the edges. Allow strata to stand 5 minutes before slicing. Substitute ground turkey or chicken for the Italian sausage. Use any of several cheese varieties that appeal to your family. Serve this strata cut in large triangles, on plates drizzled with a light hollandaise sauce. Add bacon or sausage and a light fruit salad, and the strata is a perfect light lunch or brunch idea. The texture of the strata is soft, similar to a bread pudding. If a firmer texture is desired, dry out the bread slices before using. Substitute one fresh, minced jalapeño pepper that has been sautéed for the canned product. Substitute 6 to 8 ounces of diced, cooked bacon for the Italian sausage. 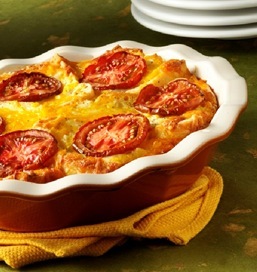 If there are leftovers, slice the strata into portions and wrap well, freezing until needed. Thaw several hours in the refrigerator and heat in foil in the oven, or microwave on low power until heated through.